I made this in the crock pot Cooked around 7 hours added retried beans I hour behind servingCame out great! 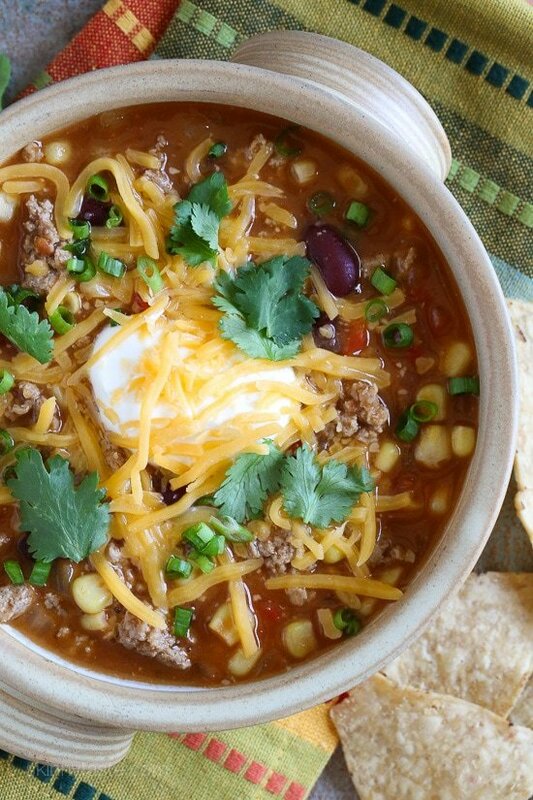 This turkey chili is oh so delicious!! I will make it again and again. Thank you for sharing this recipe. Is this something you could make in a slow cooker? I definitely want to try it but also want to start utilizing my slow cooker. Thanks! LOVE this chili! I made it last night for me and my husband and he was obsessed. Quick question – the kidney beans that I used were from Kroger and had an 11 SP value for the entire can. What type of kidney beans do you use for this recipe? Thank you so much! How much homemade taco seasoning would I use in place of the packet? Hi Gina, Love this soup, it is so delicious and satifying! Just a quick question. Is the weight for the kidney beans and refried beans in this recipe the tinned weight or the untinned? I’m also similarly confused about the corn as 15oz of tinned corn drained vs 15oz of frozen corn is quite different (especially here in Australia). I don’t want to be adding too much and then blowing out my calories! Thanks so much. So delicious and filling! Best part is it’s healthy and zero WW points. Also, the whole family liked it. We are putting it in regular dinner rotation! Thanks for all you do, Gina! I have made this soup over a dozen times. My boyfriend loves it and so do I. It is great for lunch and/or dinner. Thank you for switching up the ‘typical’ chili recipe! I made this today, my pot wasn’t big enough! I had to leave out the beans and corn. Note to self, a 3 qt saucepan will not accommodate this recipe.! I plan to add the beans, now that I’ve had a bowl. 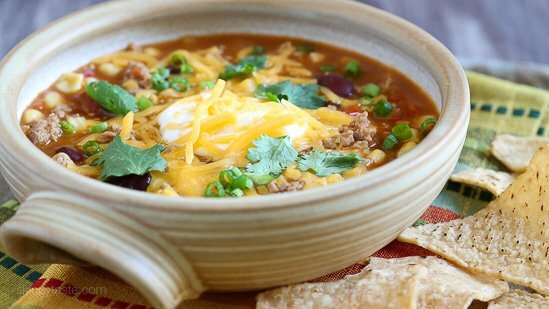 This is a wonderful soup/chili! Made it according to directions with the addition of some hot pepper flakes. The turkey I used showed up as 3 points on my WW app for 4 oz. I cooked it until it was no longer pink, then put it in a strainer in the sink, and rinsed the meat with hot water, so maybe I rinsed all the fat away? Either way, very few points and a delicious soup! This looks yummy! I haven’t made it yet but entered the nutritional info on the latest weight watchers app and it calculated to 5 smart points. I’ve noticed this with your oatmeal blueberry muffins too that the SP points value associated with the recipe does not match up when the info from the recipes are inputted. Wondering if I’m doing something wrong. I am new to weight watchers so could be user error! Made this in my IP. 20 minutes. Perfect. Both my husband and I loved it, with plenty left for lunches. This is simmering on the stove as week speak, but I had a question. I created the recipe using WWers recipe builder, and it shows that the freestyle points for this is 1 point. The only things that had points were the chicken broth (1) and the taco seasoning (5). I chose the 30% less sodium taco seasoning, and 30% less sodium chicken broth. Just wondering if anyone else had this issue. I’ve loved all the recipes I’ve made of yours, and I so appreciate you going out of your way to calculate the points for us. Da bomb!!! Made it without beans ans refried beans only because I’m not a fan. My fiance was a bit hesitant, but he LOVED it…he ate two bowls! Great go to and quick recipe! I have made this many times. I do reduce the chicken broth to 2/3 cup and make it more chili like and top it with fat free Greek yogurt and fat free salsa. So good and to make another meal I make stuffed peppers and sprinkle shredded cheese on top and bake. Delicious! Really enjoyed this soup – easy to put together and really good! I used ground chicken instead of turkey and added some extra veggies (zucchini) – followed the rest of the recipe – good stuff! This is the best ever!! Actually made the recipe without the turkey for Friday’s during Lent… so good. Love alll your recipes your amazing… thank you! The nutrients are missing the saturated fat..I still watch it due to health reasons, as this omitted intentionally? Great and super easy to prepare! What brand of FF refried beans do you recommend? 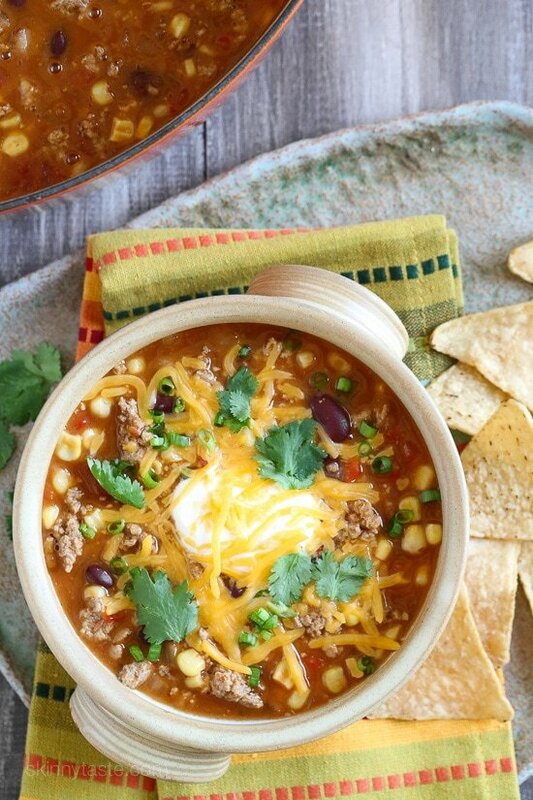 This taco soup is filling, easy to make, and is absolutely delicious! (Not to mention zero points on Weight Watchers Free Style!) As soon as one pot of soup is gone, I make another one – must have this on hand! I made this as directed and it was terrific, but I’m just not a huge meat eater so I wanted to try it another way. I just made it again and added black beans and a bit of rice in place of the meat and it was delicious. I added a bit more chicken broth as well (32 oz total) so it was a bit more like a tortilla soup as opposed to a chili, but still a wonderful flavor. When I go to print this recipe, the video image shows up as part of the print preview, and then when it prints, there’s just a giant white space on the printout (and the printout ends up being forced into two pages). Is there any way to correct that so that the video image is not part of the printout? Did you use the print button? LOVE this soup and your website! Lifesaver! I make it to last the entire week for lunch! BUT, how is this 3 freestyle points? All items are 0 points except for maybe the chicken broth or the taco seasoning depending on brand. Is this really 3 Freestyle WW points? I put it into the recipe builder and it came out to 1 point per serving (assuming 9 servings of 1.25 cups). Am I missing something? Where are the other points coming from? I love, love, love this recipe! It’s so simple and fast and I can eat it for days or freeze the leftover and they’re still delicious! I’ve put the ingredients in my WW recipe builder 2 or 3 different times and it always comes out to 0 freestyle smart points for me. I’m wondering how you calculated 3 points?Thanks so much! LOVED this! I followed the recipe exactly except I had a leftover jalapeño and some garlic that I needed to use so added that to the onion/pepper step and everything turned out perfectly! Crunched up some baked tortilla chips, fat free Greek yogurt and a sprinkle of cheese and It was heaven. A big bonus: leftovers for days!. Thank you! I’m curious where the Freestyle point calculation comes from. When I plug this recipe into the recipe builder on Weightwatchers, it comes up with zero points. It’s also very similar to the ingredients in the crockpot chicken taco chili which is listed as 0 freestyle points. Just wondering. 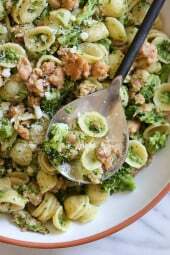 This is my first week on WW; I’m having SO much fun making your recipes! This one is amazing… my boyfriend is doing it with me and this is the perfect meal for him after he had a a high point lunch due to a work function. Love, love LOVE!!! Wondering how you got the 3 freestyle points? I put the recipe into the Weight watchers recipe builder and it gives me a 0 point value. Hi Gina – What makes this 3 FP’s? I thought it would be 0 points with all the changes to Freestyle. Will it dramatically change things if I omit the refried beans? No just wont be as thick. Very tasty & filling.. i am looking forward to the leftovers for lunch and also dinner. This soup is delicious! I had it tagged to try for a while but since I don’t usually purchase refried beans I kept putting it off. This was so simple and fast – perfect for weeknights. And of course there were plenty of leftovers which is always a plus! Next I will try this with Trader Joe’s salsa style refried beans! I am going to make a batch this weekend, but the print shortcut still has a video in it, resulting in it printing on 2 pages. I don’t know why bother with printing shortcuts on this site, because frequently simple recipes take 2 pages to print. Delicious! I added about 2 tablespoons chili seasoning, 2 tablespoons cumin and I didn’t have vegetable broth so I used chicken broth. It was so quick and easy and will definitely be a keeper in our house! I made this wonderful recipe for tonight’s dinner. Excellent and zero points, husband liked it also. This one is a keeper as well as so many of Gina’s Skinnytaste recipes. This soup is out of this world! It’s so simple and I could eat it every day and not get sick of it. 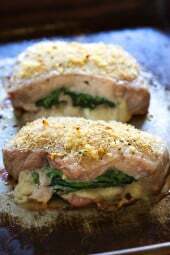 It’s very filling and feels hearty and creamy without the use of any cheese or cream. It also freezes beautifully! If I had a pot big enough, I’d make a quadruple batch and eat it for weeks. I’m obsessed. I made this in advance for tonight’s dinner. Wonderful taste and the house smells amazing! I was pleasantly surprised at how quick and easy this recipe truly is. What I love about your recipes is the use of spices and seasonings for amazing flavour instead of having to add a lot of salt. Thanks so much for another healthy, tasty recipe! Would this work on the soup setting of an instant pot? It doesn’t need that long, maybe 10 minutes. This has become a staple in my house. My toddler inhales it and even my picky husband loves it! I do use 93/7 ground turkey so there are a few points, but totally worth it. I also use clack beans in place of kidney beans just because it seems to be my toddlers preference. This freezes phenomenally so I freeze it in single serving containers and just grab one out to pack for my lunch at work whenever I need something! This is a family favorite. My son loves it and it is one of the recipes he makes on his own at school. His roommate and friends also love it. It is so easy to make. You just need to have a large pot to cook it in. Thanks for the great meal. I love this soup! Can you please tell me what the points are for the new freestyle plan? Thanks in advance. SP have been updated to reflect freestyle. This soup was on the meal plan and it was fantastic. When it said just one cup per serving I thought I’d be hungry later but I wasn’t. It really sticks to you cause it is loaded with fiber. Just delicious! I’ve made other versions of this but now this is my favorite. With the new WW freestyle does anyone know how many points? Gina, with the new Felex ponts, as long as this didn’t have any sugar in the canned beans, wouldn’t this be 0 points? WW app shws 5 pts.. not sure its updated. This is 0 SP, it was wrong in my recipe builder, I just updated! Very, very good and lots of it! This was a fantastic soup! So easy to make and very filling. I quickly cooked up a batch while at the same time creating some of the Taco Puffs. BOTH were wonderful and very filling! I had everything on hand in the pantry for both recipies! Thank you for this great soup! So unbelievably amazing! Made this today in prep for a blizzard heading our way (easy to reheat on the grill) and everyone in my house loved it! I cooked the turkey in a frying pan followed by the onions and peppers and then dumped everything in my crockpot and let it sit on high till we were ready to eat-perfect! Will definitely be making this again! This is one of my favorite recipes. So easy and so delicious! Can this be made in a crock pot? If so how? Made this in the Instant Pot tonight.. I added a can of rinsed low sodium black beans, and an extra cup of chicken broth, I was worried it would be to thick like Chili and I wanted a soup. I turned the IP on saute, and put Turkey burger , onions and bell pepper in until turkey was brown. Drain. then add everything else and put on Manual for 10min….manual release after 10min. Came out great. topped with some tortilla strips and jalapenos. Delicious! We loved it! Very easy to make. I made with homemade taco seasoning. So happy to have leftovers for my lunch today… and a container in the freezer for a future meal :). I’ll be making this recipe again. Thank you, Gina! Yet another recipe my picky kids loved! It’s perfect for this cold weather. Comfort food without the guilt. Great recipe! I followed it exactly and my family loved it. I make this for my family all the time, it is super easy & yummy! Love this soup. It’s hitting the spot on this cold day! Gina, any chance you can start indicating freestyle (FS) on the recipes so we know which ones have beeen converted? TIA! Wow…you ROCK!!! Thank you so much for making this so easy. This recipe was so yummy, and easy to make. I topped with some sour cream and two crushed tortilla chips. I’m excited for the leftovers all week. Made this tonight and it was amazing. Great flavors. Even my picky 9 year old ate it. Thanks Gina. This is very good and easy, will make again! Hi Gina! Wouldn’t this be 0pts now on freestyle?! Just made it and it’s so dang good and filling! Hello, lunch for the week! Nevermind…saw you answer another comment. I used 99% fat free turkey so mine is 0pts, woohoo! This was my first time trying one of your recipes. Being new to weight watchers, I have heard many wonderful things about your recipes! Tried this one tonight, the boyfriend, who could live on McDonald’s every day, loved it even!!! I’ll be checking out more of your recipes asap! Welcome Jaclyn! Glad you enjoyed it! Gina, what makes this recipe 3 smart points? With the new freestyle system I would think this all equals 0 points! Just curious. thanks! this is not 100% lean turkey which I dont care for, it’s pretty dry. Love this soup but trying to figure out why it still has points?? I love this and all of the work you do but the recipe calls for 99% lean turkey so shouldn’t the points reflect that? Hi Gina. I have just started doing the new freestyle and when I plug this in the recipe tracker it is zero points for a serving. I am wondering how you are still getting 3? thanks so much! Yes, still 3 or 0 with leaner turkey which I don’t prefer. This whole recipe is “free” on Simply Filling, if you make your own taco seasoning instead of buying it! Excellent recipe. Was craving soup, but wanted to stay on the Simply Filling plan with WW. I added black beans because I had them on hand. Added some fat free sour cream and cheese and it’s great. I also added more peppers because I wanted to use them up. I did use homemade taco seasoning instead of a packet. So good! I made this today and had it for dinner. It’s so good and was so easy to make. I’m looking forward to making more of your recipes. Made this tonight & LOVE it. Sitting here contemplating a tiny bit more as I type. I did add about a cup of thinly-sliced kale ribbons for a pop of green right before simmering. YUM! Another delicious recipe Gina! Delicious! Very good! And easy! I used black beans as I had them in the cupboard, and added some mushrooms (just because we love mushrooms). I also had it simmering for about an hour – only because it took a bit longer for us to be ready to eat. With the extra simmering, it was thicker than soup, but not as thick as chili, maybe more “stew” like. My husband likes to “dip” tortilla chips into chili and eat it that way, and it was thick enough for him to do to that. Really good! Try it! You’ll love it! I made this today for lunch for my husband and I. It was SOOOOO good. This is my new go to quick and easy chili recipe!! 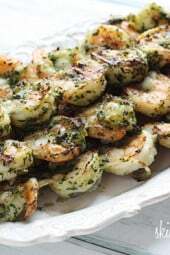 I’ve reviewed several of the recipes created for Weight Watchers Smart Points. However, none of them seem to list the Saturated Fat grams, only Total Fat grams (one of the factors in calculating Smart Points). I realize you have already calculated the Smart Points, but I always like to check the points myself. Can this be done in an electric pressure cooker? I know you asked a while ago, but in case you were still wondering 🙂 I made this in my instant pot and it came out great. Cooked meat and onions/peppers on sauté, added rest, and cooked on manual for 10. Did natural release because I wasn’t home, but probably could’ve manually released after 10 or so. Thank you! I was wondering about this as well. I love my Instant Pot! I add two can of stewed tomatoes and it is perfect. Gina, I have made this a couple of times and we love it. I particularly love the fact that just about all the ingredients are staple items from our pantry. The makes it very easy to do. Flavor is great. and it is very filling. I am making this for our Sunday dinner. Made this tonight for dinner. I added some black pepper and cumin. Really good. Thank you! Hi, I really liked this. However, it’s a little hard to believe that it’s only 225 calories per serving…Is it really that low in calories? LOL! I wouldn’t doubt it…there’s nothing high calorie in it. The highest calorie ingredient is only 350 calories for the entire can of refried beans, and there is at least 9 servings in this huge pot of soup…if not 10 to divide that by. And her serving size is 1 1/4 cups for 225 calories with no toppings. Hi, do you drain the meat after browning? This is our absolute go-to recipe. We never get sick of it and it freezes BEAUTIFULLY. I recommend making a double batch and stocking your freezer. You will be glad you did. I made this soup because I loved how simple it looked and HAD to try it! It was amazing, especially considering how easy it was! The only differences I made were we used 90/10 ground beef instead of the ground turkey (personal preference in our family) and I added 1/4 cup of sofrito to the soup because I always have it on hand. Amazing! My husband said I should definitely make it again. I am so impressed with how easy and budget friendly this recipe was and how much my husband and kids loved it, so I’ll definitely make it again! Thanks Gina – you rock! Great! Glad you and your family enjoyed it!